Slate tile has, for centuries, been a reliable and high-end roofing option. Originally used on the roofs of medieval castles, natural slate is as timelessly beautiful as it is durable. 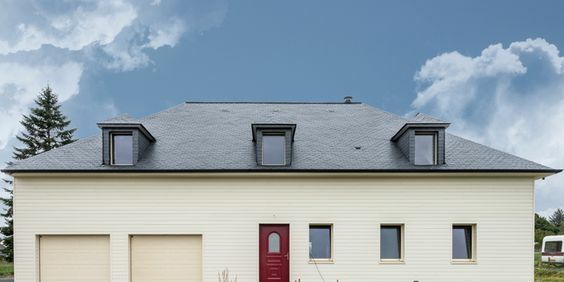 Recently, a trend in Europe has re-imagined this classic roofing material as a modern, environmentally-friendly siding option. Slate siding is acoustically and thermally insulating, ensuring that a constant internal temperature is kept and thus lowering the strain on heating and cooling systems. It has a Grade A fire resistance level, which is the highest level a building material can achieve in terms of fireproofing. Slate siding is also resistant to hail, acid rain, and has an expected lifetime of over a hundred years. It has even been known to withstand hurricane wind over 97 miles per hour. These modern rest houses in Lithuania’s capital, Vilnius, are covered in 3 different sizes of natural slate siding. Slate tiles measuring 30×60, 30×30, and 30×20 were installed to form the textured “longhouse”-like structures in 2014. Tall, skinny windows arch up along the sides of these buildings to lend a skylight effect. These structures were constructed in the resort town of Palanga, Lithuania. A high-end resort, slate siding was specified to give each home a unique, modern flair. Built in 2015, these structures feature large windows and metal balconies, and stand sentry on the shore of the Baltic Sea. On the northern bank of the Kaunas Reservoir sits the Lithuanian town of Rumsiskes. While the southern part of the town is underwater from an artificial lake, this house remains as a nod to modern architecture. Constructed in 2013, the home’s wooden facade both compliments and contrasts the natural slate siding. These modern multi-family housing units in Lithuania’s capital feature large, pocketed balconies that offer both privacy to its occupants as well as a unique, modern design. Built in 2016, these housing units feature varying shades of wood and natural slate siding. 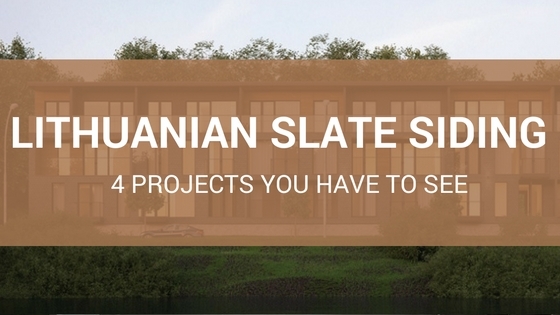 For more information on these slate siding projects, visit CUPA USA.